Female volcanologist Jess Pelaez is changing the face of the Discovery Channel on the new survivalist science series Trailblazers. Extreme science in a man’s world is “Volcano” Jess Peláez’ specialty. For the new Trailblazers series on Discovery, Volcano Jess brings the excitement of working on active volcanoes home. Each hour-long episode of Trailblazers follows three separate teams of survivalists and scientists through some of the most dangerous regions of the world. These teams are searching for clues and discoveries that could lead to scientific breakthroughs. Trailblazers ventures to the largely-unexplored island of Papua New Guinea, to the Jurassic Park-like jungles of Bolivia and the volcanic landscapes of Ecuador. The teams must use all their science and survival skills to get the job done and get out safely. 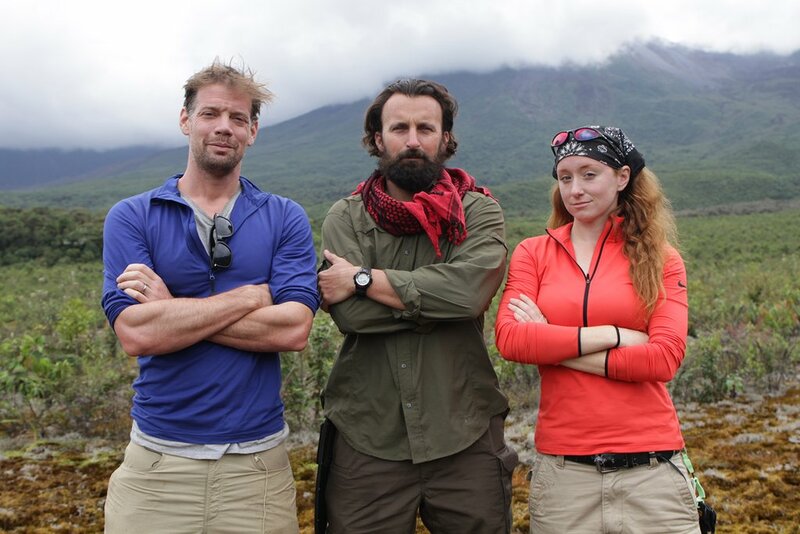 Jess must dig deep to uncover the secrets of Ecuador’s dangerous and remote Reventador volcano. She partners with survivalist Shaun Keilen and geophysicist Jeff Johnson to tackle the volcano. Reventador is currently spewing lava bombs and ash columns that could make work deadly. “Trailblazers is an important opportunity to show the public how crucial field science really is. Having boots on the ground, even in difficult locations, can make or break a scientist’s work. The men and women who take on these challenges know how critical this knowledge is to our world,” says Peláez. “VOLCANO” JESS PELÁEZ has spent the last decade working on volcanoes and natural hazards worldwide. Jess has explored undersea volcanoes, climbed the Andes Mountains, and sampled flowing lava. Her experience as a field scientist led her to found Blueprint Earth, a new kind of environmental science and education nonprofit that engages groups of people who are traditionally underrepresented in the sciences. Jess is a Fellow in the world-famous Explorers Club, and is an advocate for women in science and for strong field science research. She is a graduate of California State University - Los Angeles, Smith College, and J.K. Mullen High School. Trailblazers is produced for Discovery Channel by October Films. For October Films, Chris Muckle, Jake Laufer, and Matt Robins serve as executive producers. For Discovery Channel, Christo Doyle is executive producer and Katlyn Higgins serves as associate producer. Trailblazers airs on Discovery Channel Saturdays at 11PM EDT. Volcano Jess Peláez lives and works in Los Angeles, California and can be contacted for additional information through her website, volcanojess.com, or by phone at 310-272-0875. The cast of the new Discovery Channel series Trailblazers.